From signs and clothing to decals and stickers, vinyl cutters are invaluable tools for designers. We’ve looked at vinyl cutters to find the best in precision cutting for graphics; there are models appropriate for use at home or your business. Here are the top ten vinyl cutting machines we’ve found. This vinyl cutter is stand-mounted at 34 inches tall and incorporates two fully adjustable pinch-rollers. 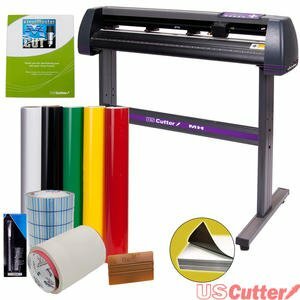 The MH series cutter includes everything you need to start making signs, decals, and more. You’ll get a great deal with this tool, as it includes five rolls of vinyl of differing colors, software, and additional tools such as extra blades, a vinyl banner, magnetic blanks, transfer tape, and a squeegee. This MH series cutter is a great tool for people looking to get started in sign making; this one is not suitable for the home hobbyist. The only downside is that it is not compatible with Mac OS. This kit by Silhouette is chock full of goodies to get you started. The Cameo 2 features a user-friendly touchscreen, and you can be sure of your purchase with a 1-year warranty. The Cameo 2 can sit on a desktop and accommodate a variety of materials. This kit includes four popular starter sets for vinyl, heat transfer, rhinestone, and fabric. The kit also includes a 24-piece sketch pen set, glass etching cream, dust cover, and cutting mat. 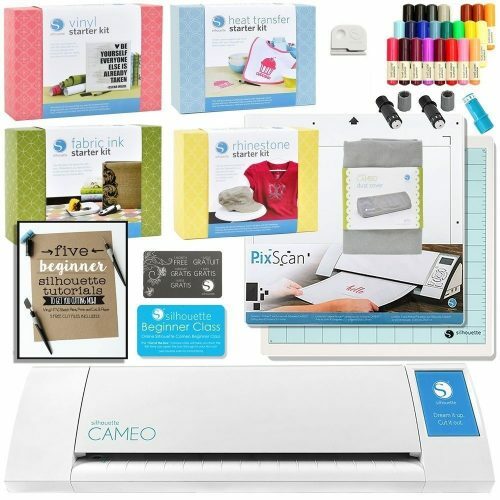 If you’re new to this type of machine, the Cameo 2 comes with their best-selling starter book. No matter your goal, there are enough supplies for any starter project. 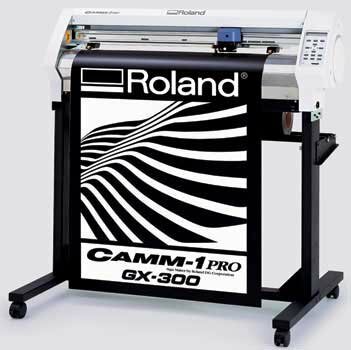 Roland is one of the top brands in the vinyl cutting market, and the Pro GX is no exception to their excellent reputation. This model is suitable for business owners looking for high-quality performance and a unit capable of handling even the heaviest materials. The machine can take materials ranging from window film to sandblast, and the Pro GX can even handle contour cutting. This machine is fast, cutting material up to 33 inches per second, so you can complete all of your projects efficiently. With a maximum material width of 36”, Roland’s Pro GX can handle all of your professional needs. This excellent vinyl cutter includes Artcut software, making it easy to import your own fonts and images for your design projects. The unit includes an LED-backlit display, and works fast at a feed rate of up to 32 inches per second. Along with the cutter, software and three extra blades, you’ll get a stand with your unit, perfect for your business workspace. While this isn’t the best unit for a home beginner, this is an excellent economical choice that is perfect for cars, the advertising industry, and fashion. 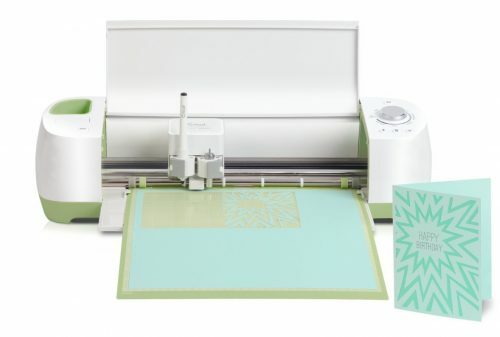 The Cricut Explore is a very popular model capable of handling over 50 different types of materials beyond vinyl, including vellum, paper, and leather, giving you a full range of options to create beautiful projects. This is perfect for the home do-it-yourself-er looking to create professional-looking designs. Precise Smart Cut technology allows you to cut fonts as small as ¼” and as large as 23.5”tall. 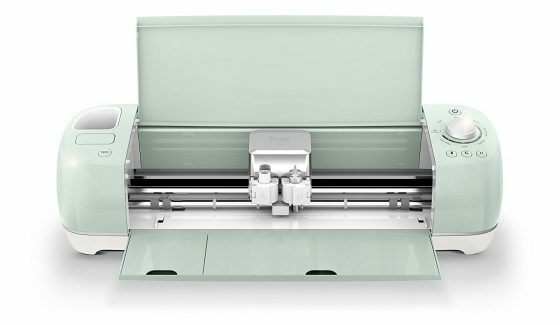 The Cricut Explore includes the Cricut Design Space free online design software, giving you access to hundreds of ready-to-make projects. The Explore even works in conjunction with your cutting machine to print full color stickers. 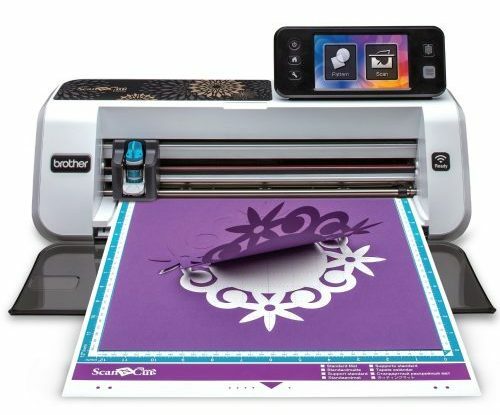 This home cutter, from reputable brand Brother, is a perfect choice for the home hobbyist. The updated cutter includes a 30% larger LCD touchscreen than its predecessor at 4.85”. The unit includes a built-in scanner, which is a great feature for those looking to create your own cut files. The machine includes over 600 free designs and seven fonts and has the ability to read SVG data files. 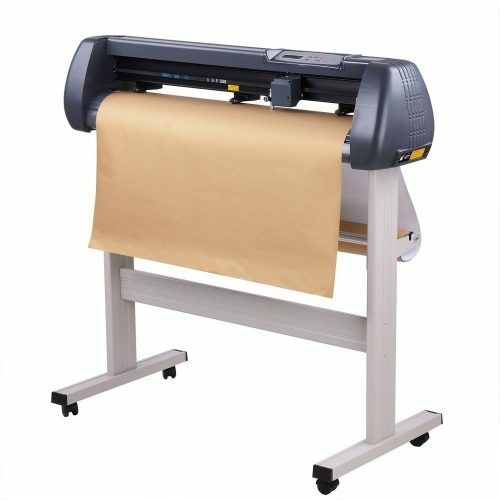 The ScanNCut2 works as a stand-alone cutter, or can connect via PC and is wireless network ready. 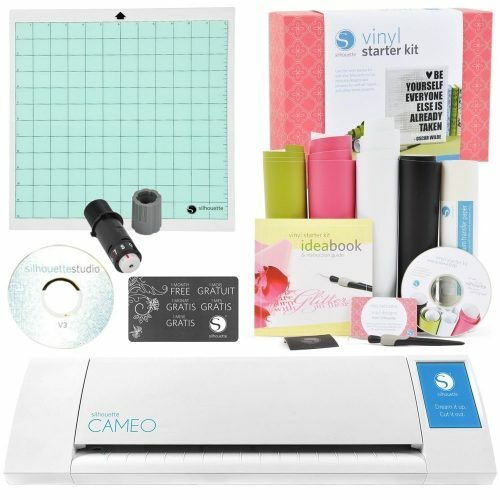 Another unit perfect for home crafters, this vinyl-cutting bundle from Silhouette comes with everything you need to get started on your home projects. You’ll get software, templates, four rolls of vinyl in different colors, vinyl trimmer, and a cutting mat. This machine is capable of cutting paper, cardstock, vinyl, fabric, and more, so you can get the ultimate DIY experience. You even get a $25 value download card good for 10 vinyl designs. The machine makes it easy to set blades settings with the touch of a button! The Titan 2 by USCutter is a great choice for the professional level. The unit and stand are easily transportable, featuring four wheels. There is a contour cutting function, and the durable machine is constructed from aluminum alloy. 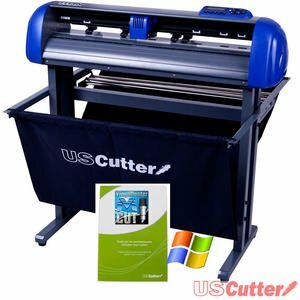 In addition to vinyl, the cutter is capable of handling materials such as sandblast, hard paperboard, and window film, The cutter also features a Servo motor and is compatible with PC and Mac, although the included software is PC only; Mac users can get an alternative choice from the USCutter website. 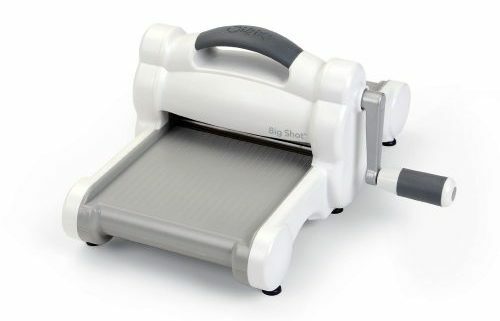 This is the newest Big Shot model from Sizzix, and it includes an extended platform for added project flexibility. The cutter is a roller-style machine, and can accommodate multiple material options, including paper and fabric. This is a smaller, tabletop model perfect for the home hobbyist on a budget. You even get your choice of color with either a white/grey color scheme, or a vibrant teal. You’ll get the added bonus of the machine being extremely light and portable. The top product we found for vinyl cutting is another winner from Cricut. The machine is Bluetooth compatible for wireless printing, and you can even create designs from your smartphone or tablet. You can work with over 100 types of materials, including vellum and leather. The Air 2 includes a Fast Mode setting for rush projects, and you can use your own designs created in Photoshop, etc. Whether you’re looking for a DIY project, or you operate a business, there are options for all of your needs and budgets. Choose the right one for you and get started on those designs!